The name “Bel Air” has a classy ring to it, and that’s definitely the case with Gilbert melendez’ ’57 chevrolet Bel Air. This luxury classic was completely gone through and the project has never stopped as Gilbert and his brother Frank will do whatever they have to do to get the job done right. Gilbert started off by buying an ’88 chevy camaro and taking out the small-block 5.7-liter engine to be used as a donor engine for the Bel Air. The engine was taken apart, even though it was out of a running car, and then punched out .040 over. A mild cam was used to give the classic a sports car feel. Before the engine was reassembled, Gilbert broke out his new Sata 3000 spray gun and sprayed the engine block and aluminum heads in candy “burple” to match the exterior of the car. With the paint gun out, the fenderwells and firewall were also sprayed to match. The engine was hooked up with several bolt-on chrome aftermarket parts. Hedman “hedders” were used to allow the engine to breathe better. An edelbrock endurashine carburetor and Professional Products intake combination gets this vintage small-block running like a newerstyle engine. 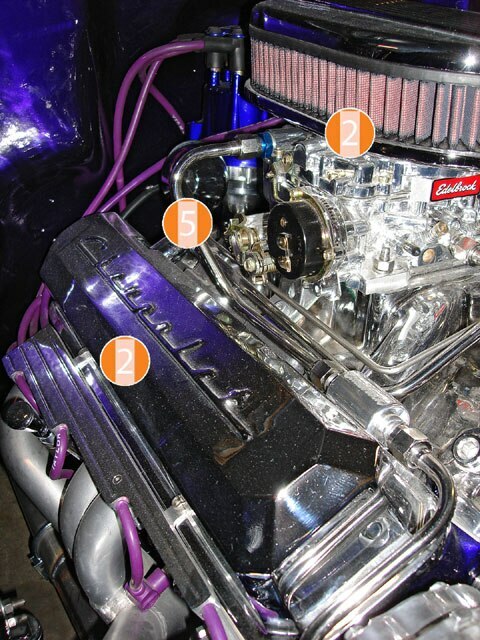 An edelbrock mechanical fuel pump was used to feed the carburetor and keep the fluids running consistently. All-new arp fasteners give the engine the final details that they were trying to achieve, while a set of chrome ABS brakes provide excellent stopping power. With the help of his brother and friends, Gilbert was able to get the engine compartment of this classic Bel Air looking like that of a modern day ride. We can’t wait to see the completed project. Maybe we’ll see this ride featured in an upcoming issue of LRM. March Performance pulleys and brackets were used to keep this engine running true.A chrome air cleaner and Pml billet valve covers dress up the engine.A matson radiator was mounted on the billet radiator core support to keep the car running cool.Chrome and paint were used throughout the engine compartment to tie into the exterior of the vehicle.Cool-Flex hoses and hard-lines add further highlights to the engine compartment.If you feel that you have an engine worthy of our From The hood section feel free to contact us at saul.vargas@sourceinterlink.com. A chrome air cleaner and Pml billet valve covers dress up the engine.Cool-Flex hoses and hard-lines add further highlights to the engine compartment. 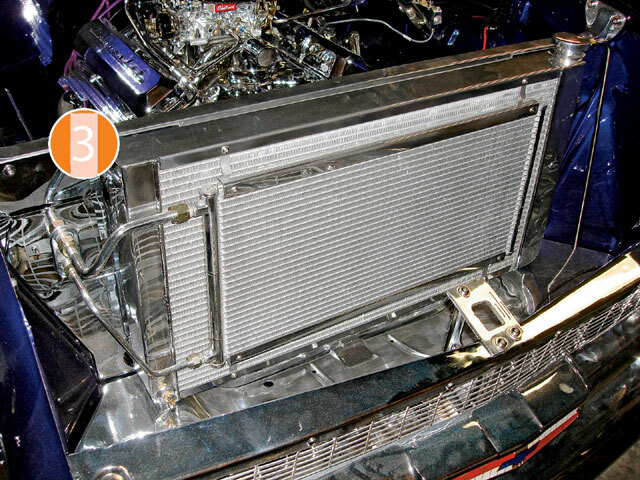 A matson radiator was mounted on the billet radiator core support to keep the car running cool.